Halloween is such a fun holiday to send Missionaries a Care Package because you can find ‘Box’ items so readily – but trying to make it ‘Spiritual’ can be a little bit tricky. With this box we centered our theme around the scripture Mark 16:15 ‘Go Ye Into All The World And Preach The Gospel To Every Creature’. We all thought the ‘Creature’ part sounded perfect for a little Halloween fun to be included in the care package! If you would like to send your own ‘Preach The Gospel To EVERY Creature’ care package to your Missionary – check out this kit we put together to help you do just that! 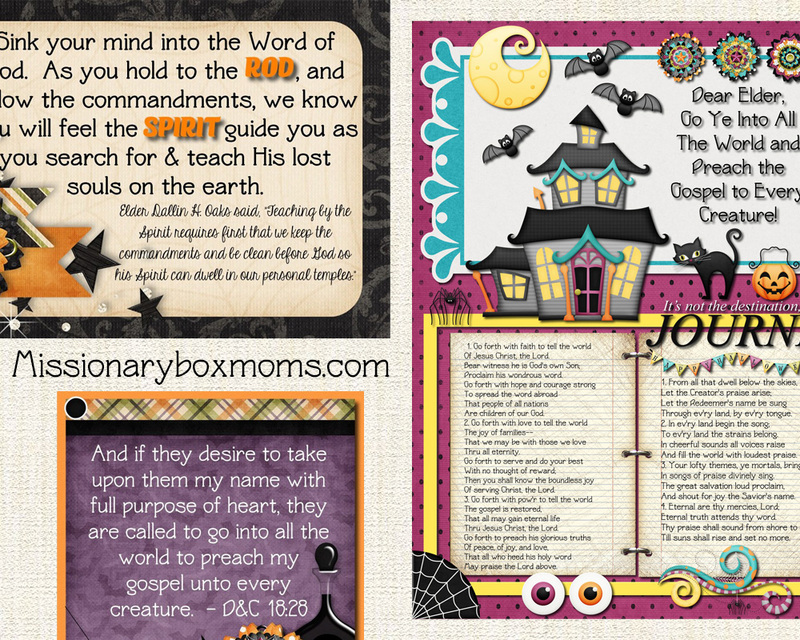 ✔ 7-Pages of Custom Halloween Gift Tags and Quotes to continue with the theme of the box. Boo Who!!! Scary Creative!!! As we decided on each ‘Missionary Box Theme’, which we based around a scripture or missionary teaching idea, we would then brainstorm fun ideas that could be included in our box. I often wondered if our missionaries realized how comprehensive we were in our themes! It honestly might have been just as much fun for us to build these boxes as it was for them to receive them! Depending on the size of the box you are sending – you could include or delete any of the following items – or come up with a few of your own. We tried to make sure that most of our items could be used to enhance missionary discussions, to be given away, to decorate their missionary apartments and left for future missionaries when they moved on, or simply eaten and enjoyed. But of course, since it was Halloween, there were always a few that were just for fun! Bugs & Hisses!!! One thing we always included in all of our Missionary Box Mom Boxes was a personalized letter to each Missionary from each Mother. Inside our letters we included our testimonies, the reason we chose that particular item to include in the box, along with uplifting messages filled with love. A lot of the items won’t make much sense as to why you are including them in the box unless you explain how it specifically applies to your Missionary and to Missionary Work. Many times over I have received thank you letters from our Missionaries – but the things they thanked us all for the most was the letters we included. It’s just a little piece of ‘Home’ in a box! So don’t forget to write! It’s Always Fun To Include Some Photo Op Props for our Missionaries to have fun with on their P-days inside their apartments – and the pictures we receive have never disappointed!!! So just for fun – throw in some Missionary Halloween Costume Props and see what your Missionary comes up with! We always include a costume for both our missionary and their companion – so with these costumes items we had a Purple Sister set and an Orange Sister set. (Halloween Spider Web Masks, Halloween Soft Socks, Wack-O Wax Lips, and Halloween Witches Hats with 2 hair clips.) Sometimes though there might be 4 missionaries living together – so you will have to adjust your number of costumes appropriately. In past years we have included Foil Hair Wigs, Colored Mustaches, Hats, Funny False Teeth, etc. all from the Dollar Tree Store. Really anything goofy that catches your eye would probably be put to good use! For I, the Lord, will judge all men according to their works, according to the desire of their hearts (D&C 137: 9). therefore we see that the Lord doth counsel in wisdom, according to that which is just and true. But that’s just Witchful thinking!